Start reading Family: New vegetable classics to comfort and nourish on your Kindle in under a minute. 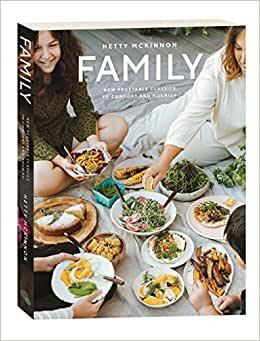 Veggies and family favourites take a starring role in this new collection of crowd-pleasing meals, simple sweets and family stories from bestselling cookbook author, Hetty McKinnon. Hetty’s book shares wonderful stories from her own family as well as other families of different backgrounds. She writes beautifully and from the heart about family meals. How they’re not fussy or pretentious, but nourishment from the heart. I’m in love with this book already! The photos are stunning and from the talented Luisa Brimble. 5.0 out of 5 starsBeautiful book, delicious recipes! As someone who is a newbie to cooking, this book is both inspiring and approachable. Everything I've made from it so far has turned out to be absolutely delicious and has been a hit on the few occasions I've made the recipes for friends. Hetty's thoughtful recipes layer flavor allowing vegetables to be the star of the meal or the perfect compliment to a different protein. In addition to the recipes, the photos are stunning. You truly feel like you're being invited to be a part of her Family. Recipes are super easy yet packed with flavor. Photos are also beautiful and I really enjoyed the addition of the family stories. Loved it so much I bought a second copy to gift some friends. 5.0 out of 5 starsVegetarian recipes for family and friends. Simply delicous recipes that comfort the soul. Highly recommend this book for all vegetarians looking for some new recipes with style. Easy to follow and prepare, your dishes will look professional.